The Canadian liner Empress of Ireland was sunk in a collision with a collier at the mouth of the fog-shrouded St. Lawrence River in the spring of 1914, not long after the Titanic disaster, and it took even more souls to a watery grave with her. Because the ship was not as large, or laden with as many famous people, and because the disaster happened so soon after the Titanic incident and the start of World War I, the story never gained the historical significance it deserved. Few people today even remember that it happened. Struck amidships by the heavily laden Norwegian collier Storstad, the Empress of Ireland flooded so quickly it sank in just 14 minutes, catching most of the 1,477 passengers and crew members in their beds. Of this number, 1,012 were lost, eight more than died on the Titanic. The Empress of Ireland, under the command of Capt. Henry Kendall, was outbound from Quebec, on its way to London, on the morning of May 29. 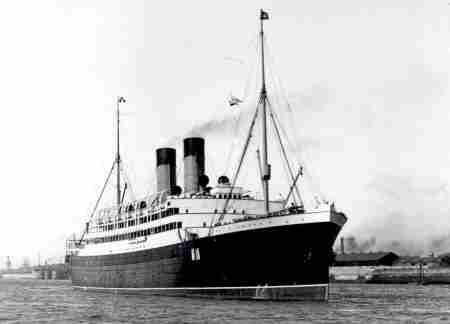 Among the passengers were the actor Laurence Irving and his wife, actress Mabel Hackney, returning from a successful Canadian tour. Also on the ship were about 170 members of the Salvation Army heading to a convention in London. It was around 2 a.m., on a calm, clear night. The liner had just cleared the narrow waters of the St. Laurence River and just dropped her pilot at Father Point, so was close to shore. Approaching from the other direction, steaming upriver, was the Storstad, also hugging the coastline in preparation for picking up its pilot. Captain Kendall told authorities he saw the approaching Storstad before the fog closed in. He guessed that she was about eight miles away so he had ample time to cross her bow before he set a course for the open sea. When he judged he was safely beyond the collier’s course, he set a new course. It was at about this time that a creeping bank of fog swallowed first the Storstad, then the Empress. Ironically, it was estimated that if the two ships had maintained the course they were on, they would have passed each other in safety. But the fog made both men at the helm nervous and they took what they considered evasive action that set them on a deadly collision course. Captain Kendall said he gave three blasts on the ship’s whistle, telling the other vessel that he was ordering his engines full astern. He slowed the 14,191 ton liner to a crawl, but kept the vessel on the same course. On the bridge of the Storstad was the first mate, whose name could not be found. This man said he saw what he thought was the liner’s red navigational light just before the fog closed in. He thus thought the Empress’s portside was showing and that the big ship had turned to pass him on the port side. After a few minutes of wondering just where the liner was in the fog, the mate said he grew nervous and ordered the collier on a starboard turn, away from where he thought the other ship would be. Instead, he turned directly into side of the passing liner. By the time the two ships were in sight of each other, it was too late to avoid the crash. The heavily laden Storstad was riding so low in the water that its thick bow stabbed through the liner’s steel hull like a knife, some 25 feet below the water line, delivering a fatal wound. The water flooded the lower compartments, then rushed into open portholes, flooding the liner so fast people were caught in their cabins, unable to escape. The ship quickly listed to such an extreme that only about six lifeboats could be successfully launched. Within 10 minutes the Empress was tipped completely on its side with hundreds of passengers clinging to its hull. Even though several other vessels were in the area, and they quickly came to the aid of people struggling in the freezing waters, there were few survivors. Thus the Empress of Ireland disaster remains among the worst in world naval history.